Kevin Kolb won’t save the Arizona Cardinals. Kolb will obviously be a huge upgrade compared to last season’s committee of quarterbacks (Max Hall and John Skelton), but they have done nothing to address their flat out, awful defense. The Cards ranked 29th in the league in total defense giving up a flopping 27 points per game, this defense also just traded away their Pro-Bowl CB Domnique Rodgers-Cromartie. Things aren’t looking so good when you have no defense and running game (last). How long before Ryan Williams takes over for Beanie Wells? Secondly, I am not totally sold on Kolb and think the idea of giving him the reigns wasn’t the best idea. He hasn’t impressed me at all with his 3-4 record as a starter, not to mention his 11TDs: 14INTs and 7 fumbles. He also ran a totally different offense in Philly that was loaded with playmakers. The Cardinals need a veteran quarterback, kind of like the time they went with vet Warner over Leinart. I just don’t see Kolb coming in and making this team a playoff contender right away. Let’s see how the Cards pay off with this gutsy move. The Cincinnati Bengals will be the worst team in football. It doesn’t help when you have one of the, if not, worst owner in pro football. The Bengals has had only two winning seasons since 91’ and their losing woes will continue into 2011. Their young defense has had its moments, but the offense enters the seasons with huge question marks. With owner Mike Brown having an ego battle with Carson Palmer, the Bengals will be forced to use Jordan Palmer or 1st round pick Andy Dalton. Both quarterbacks are inexperienced and will need all the help they can get. The Bengals drafted A.J. Green, who will turn out to be a stud, but besides that, there isn’t much help for Palmer/Dalton. Simpson and Shipley had their moments, but the Bengals will need a veteran somewhere along their skill players. Resigning Cedric Benson will not be the answer. The Tampa Bay Buccaneers clinch a Wild Card spot. This young Tampa squad surprised us all last season when they made a run for the Wild Card. They also turned more heads with the great draft they had in April as well. With budding stars Josh Freeman, LeGarrette Blount, and Mike Williams, this Tampa team can only get better. People tend to forget what this Buccaneers team achieved last season despite all of their injuries. They only lost the big tank Gerald McCoy, receiver Aurrelious Benn, safety Cody Grimm, and linebacker Quincy Black. Not only that, safety Tanard Jackson was suspended for the year due to a substance violation. With the addition of their draftees (Adrian Clayborn and Da’Quan Bowers), the Buccaneers could really improve on the defensive side of the ball. Expect them to contend for the NFC South. Donovan McNabb will resurrect his career in Minnesota. After rocky season in Washington, McNabb will be looking for redemption. Even at 34 years of age, McNabb still has a little left in the tank. If some people don’t remember he only threw for 426 yards against the Texans, 357 against the Packers, and 376 against the Titan, so don’t tell me he still can’t sling the pigskin. In Minnesota, McNabb won’t have to carry the load as they have arguably the best running back in the league. With opposing teams having to stop the run, it should give McNabb some openings in the play-action game when teams stack eight in the box. He has never had the chance to play with an elite running back and it will make a difference. With Percy Harvin, Bernard Berrian, and Visanthe Shiancoe, he should be able to make some plays. Out of all of the quarterback moves, McNabb is put in the best situation to succeed. The Vikings still have a pretty good defense. The addition of Donovan makes the Vikings around a 9 win team, which could possibly be a Wild Card contender. Ray Rice will lead the NFL in rushing yards and receiving yards for running backs. The Baltimore Ravens decided not bring back Willis McGahee and LeRon McClain, which could only mean one thing: Expect a lot of Ray Rice. With these two no longer stealing carries from Ray Ray, he looks to control the show. In his first 2 seasons as the starter, he showed promise rushing for 1,339 and 1,220 yards. Now with the addition of FB Vonta Leach, look for more gaps for Rice to run through. Leach has been one of the top lead blockers when he was in Houston and this will not change here. Rice is also another receiver in the backfield, therefore is a threat at all times. The Ravens’ offense is expecting big things this season and it all starts with Rice. Kevin Kolb checks in at #12...could he end up even higher at season's end? What an exciting matchup right? History will be in the making that’s for sure. 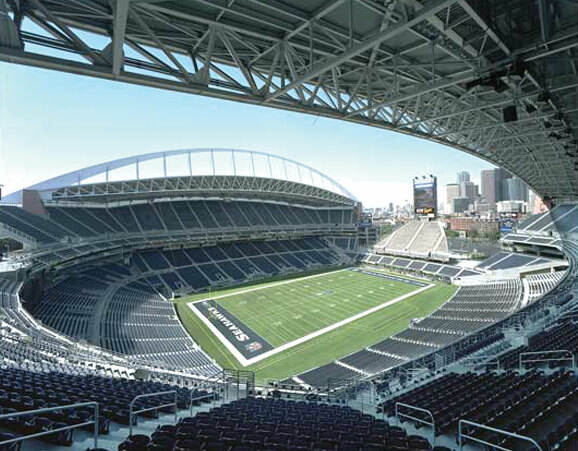 The New Orleans Saints (11-5) are headed to Seattle to take on the Seahawks (7-9). That’s right, for the first time in NFL history a team with a losing record after a full season of games is hosting a playoff game. The NFC West turned out to be a joke of a division and was decided on the last day of the season. My only major concern for 2010 champs is having such a weak opponent that they look a head to the divisional round. This is the definition of a trap game. Another thing that could turn into a problem is the fact that the Saints top two running backs are on injured reserve list. Will the Saints having a running game with Reggie Bush and Julius Jones toting the rock? Does it matter? With Drew Brees at the helm the Saints are always in good hands. After another superb season leading the Saints offense, Drew Brees couldn’t have asked for a better matchup. Seattle is 27th in the league against the pass, so I expect Brees to be hitting on all cylinders. As long as Brees takes care of the football and the Saints can pressure whoever the Seahawks decide to start at quarterback, they should be fine. Regardless of who Seattle tabs as the starting quarterback, keeping his jersey clean is priority number one. During last weeks game against the Rams, starting left tackle Russell Okung aggravated his bad ankle again. He is the key to there offensive line and the quarterback’s health. He will be greatly depended on to stop the likes of Will Smith or whoever the Saints send his way. It showed when he had to come out of the game last week for a couple of plays. The line had to shift its blocking more to the left side to overcompensate for Okung’s replacement. The Seahawks need him to play at a high level if they want a chance to put any points up on the board. I also believe Marshawn Lynch will need to have his first 100 yd rushing performance of the season to keep this contest close. Keeping Drew Brees and the Saints offense off the field will be another major factor in this game. If they can do these things I believe they have a chance. Any given Sunday err Saturday right? I hope I’m wrong, but I think this will be the most lopsided game of the postseason. The Seahawks don’t match up well against New Orleans, and I don’t see the Seattle offense keeping up with Brees and the Saints. Sam Bradford was set up for failure this season. He came to the St Louis Rams as the number 1 pick overall after spending the majority of his junior season at Oklahoma injured and unable to play all but 4 games. He also went to a Rams team that allowed the 7th most sacks in 2009, had a veteran QB mentoring him who hadn’t thrown a pass since 2007, and who’s leading receiver from the previous season recorded only 589 receiving yards and was already out for the 2010 season. 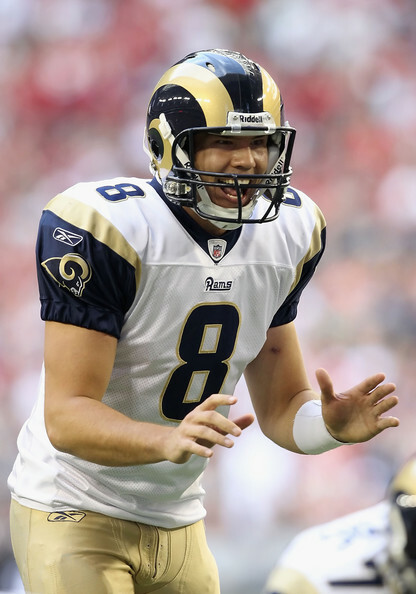 Despite all the odds being stacked against him, Sam Bradford has found a way to take St Louis from the 29th worst passing offense to 19th this season and also help get the Rams within 1 win of the playoffs. The interesting thing is barely anything has changed on offense; Roger Saffold is the only other new starter on offense who’s been starting all season long. With the exception of Mark Clayton and Danario Alexander (both have played 5 games each), Bradford has had to make do with the same receiving targets as last year. With the exception of Danny Amendola who’s a Wes Welker clone, I have a hard time believing that any the St Louis receivers would be any better than the 4th receivers on any other team in the NFL. When you look at Bradford’s numbers, they aren’t anything special. His yards per attempt is below average at 6.1 YPA and his QB rating is mediocre at 78. However, what I’ve been most impressed with is he’s been able to limit his turnovers despite having thrown the 3rd most passes this season. Most of the time whenever a QB starts throwing over 30 passes a game, they get sloppy and make mistakes. Couple this with the fact that most rookie QBs have high INT numbers their first season and you’d expect Bradford to have more than 14 INTs. It’s actually not bad when you consider how many passes he’s thrown too. Right now he averages an interception every 39.6 attempts. The last rookie QB to post a better number than that was Charlie Batch in1998 and he didn’t start every game. Not even Mark Sanchez, Matt Ryan, Joe Flacco, Ben Roethlisberger, or Peyton Manning had a better interception per attempts ratio. While Mike Williams should definitely be in the discussion for offensive rookie of the year after his solid season, no player has succeeded with less or been put in a worse position than Sam Bradford. Despite all this, he’s found a way to win and get it done with much less than most teams have. Bradford should have no problems winning offensive rookie of the year and rightfully so. Everywhere you look, most experts and media claim that the OROY has been a lock to Sam Bradford, but quite frankly, I disagree. Even though the frontrunner, Bradford, has had an outstanding year, Mike Williams deserves some serious recognition. 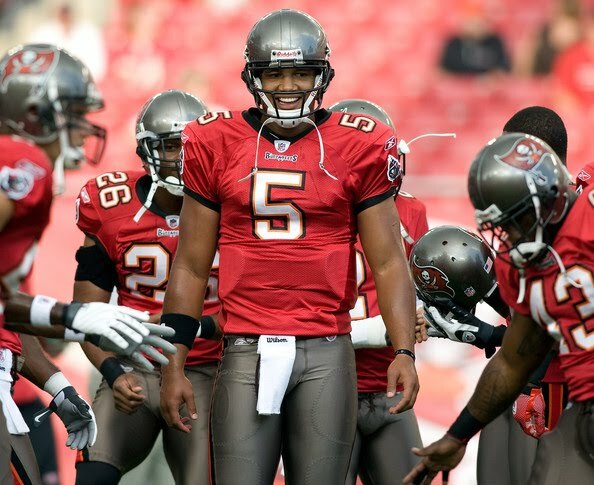 As a rookie, Williams has become a favorite target (122) for second year quarterback, Josh Freeman. In his first year, Williams currently leads the Bucs’ in touchdowns (10) and receiving yards (924), and is second on the team in catches (61). Not many people across the nation, including many Buccaneer fans, expected this sort of production out of Williams. For starters, he was the second receiver taken off the board (4th round) by Tampa in the 2010 NFL Draft, behind Arrelious Benn (2nd round). In addition to improving Tampa’s pass offense, Williams has helped Tampa become a playoff contender this season, after a disappointing 4-12 season in 2009-10. In my opinion, a quarterback being more high-profiled has been one of the factors why Williams has been written off in the OROY race. But, if you look into some key numbers, some can argue that Williams has had just as good a season, if not better, than Bradford. Bradford is currently ranked 24th in quarterback rating (78.0), behind the poor Alex Smith. He has also only thrown 18 touchdown passes thus far (18th in the league) despite being third in the league in pass attempts, only trailing Peyton Manning and Drew Brees. Bradford has had many opportunities to let the ball fly, yet he isn’t in the top ten in either touchdown passes or passing yards. Mike Williams, on the other hand, squeezed the most out of his opportunities. Williams is currently tied for 5th in the league for touchdown receptions (10) and is 20th in yards. He is getting a lot of production despite Tampa’s run-first offense. Josh Freeman’s is ranked 15th in the NFL in pass attempts, resulting in fewer chances for Williams to make big plays. Even though Bradford has had the 3rd most pass attempts in the league, the Rams only average about 209 passing yards a game which is nearly equal to the Buccaneers. Bradford is averaging only about 6.06 yards per attempt which is second lowest in the league behind Jimmy Clausen. With that many attempts you think he would do a little better, especially when you play in the worst division in football. Not a single team in the NFC West has a winning record. Hell, the Rams haven’t even beaten a single playoff team this entire season. I’m not saying Mike Williams is going to win OROY, but I really do believe, he deserves a serious look. Either way, you can’t go wrong with Williams or Bradford.